For those who followed the first edition of BB Slam, the drama would be recalled when Prestige Ifeanyi Bernard who won the written Stage of the competition went ahead to win the performance stage. Mesioye Affable Johnson and Olalekan Abe were second and third respectively at the written stage, but while Olalekan maintained his third position in the performance stage, Mesioye was overturned by Okeke Jerome who eventually won the second position after all performances. 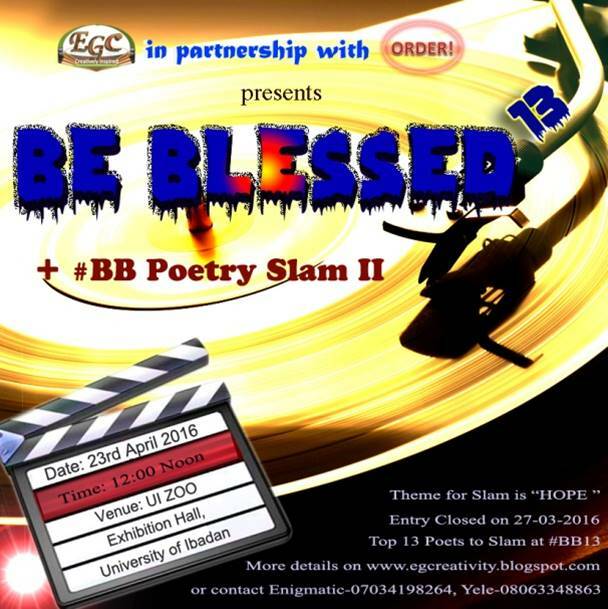 Now in the second year, Be Blessed Slam is here again, are we going to witness similar drama? 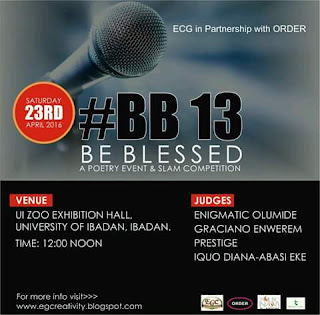 The judges Graciano Enwerem, Iquo DianaAbasi Eke, and Enigmatic Olumide who is going to be replaced by winner of first edition (Prestige) during the performance stage were fair in their opinion. Though they noted all entrants were very creative and the poems were very good, they noted most entrants did not address the theme very well. Some presented political poems, yet did not say much about the theme- HOPE. One entrant wrote on love, but he addressed the theme well and it was no surprise he made the final list. But the number one poet in the written stage this time might not be known to many people; his name is Michael Oluwagbemiga Sile. He is probably the poet to beat in the performance stage. Mesioye Affable Johnson came second in the written stage again. He probably might be vexed for missing out on final top three last year and just go ahead to win this year. Number three on the written stage is a fast developing poet, Samuel Amazing Ayoade. He is also one Poet to watch out for. But then, we may just be surprised if we see some poets come from behind and occupy the top three positions. These Poets qualified based on their superior average scores. Number 10 was placed above 11 because the entry came earlier than the one with similar score. These Poets will be placed on stand-by, if any of the 13 poets do not come for the slam, like we had one case last year, they will be moved up according to their score. Winner of BB Slam II will be given right to produce a major poetic soundtrack for an upcoming film that is centered on relationships around cancer patients. A spoken word video will be shot for same poem. 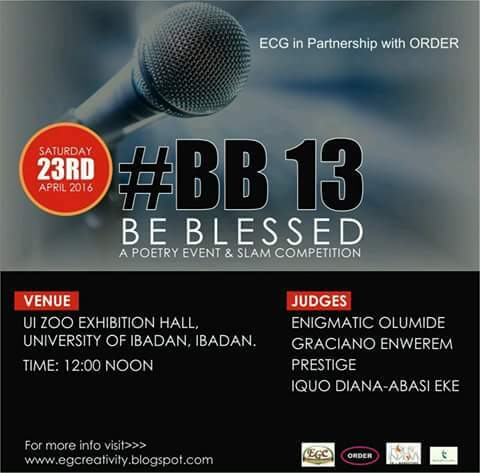 The top 5 finalists will also get opportunity to do a joint spoken word audio for the same project. The film, to be produced by EGC media, is currently in the process of production. Congrats to my Son, You will make it to the TOP by God's Grace!